A delightful and salacious debut novel about the frightful world of high school, SATs, the college essay, and the Common Application – and how getting in is getting in the way of growing up. Tiger mothers, eat your hearts out. Anne the “application whisperer” is the golden ticket to success. Working one-on-one with burned-out, helicopter-parented kids, she can make Harvard a reality. Her phone number is a national secret. Her students end up at the best of the best. But sometimes acceptance comes at an enormous cost. In a world of cheating scandals, huge alumni donations, and lots of inside pull, some parents know no bounds when it comes to ensuring that their children get in. It’s Anne’s job to guide students to their own destinies, beginning with their essays. 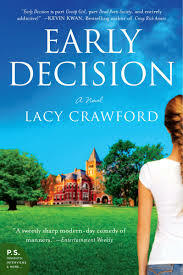 Early Decision follows five students–four privileged, one without a penny to her name–as they make their applications and wrestle with fate. To write the perfect personal statement, they must tell the truth. And the stories they tell are of greed, excess, jealousy, deceit, money, ego, and pressure, as well as of endurance, tenacity, victory, and the hope of surviving their parents’ wildest dreams so they can begin to live their own lives. Early Decision captures the most ferocious season in a modern family’s life. Parents only want the best for their children, and students are fighting for college seats that will give them a head start into work and adulthood. Is it possible to face the fall semester of senior year without losing your mind? Told in part through the students’ essays, unsparingly revealing the secrets of college advisors at the highest levels, Early Decision is an explosive insider’s guide to college admissions in our day. It’s also a sharp commentary on modern parenting. The truth is, the kids are all right. Their essays are fabulous. But the system is broken. 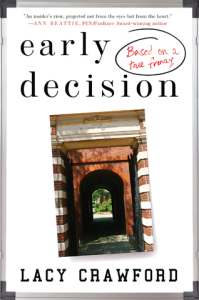 With humor and hard-earned wisdom, Early Decision illuminates the madness of the college race.